The Nerdy Teacher: Why I love Free Rice! So I haven't played with the new Free Rice since they've changed it up a bit. However, I can say that my kids LOVED it last year! In the midst of preparing for their first ever standardized test (California Achievement Test), I thought we should do some "fun" vocabulary activities...Little did I know that when I would introduce the site to them (the same week of the Haiti earthquake), they would be compelled to work their hardest to help feed people across the world and not just consider it a game. 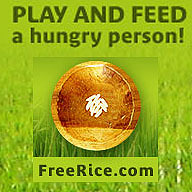 The link to find out how the game helps feed people made some of my students cry. Mind you, many of my students only have the free breakfast and lunch at school because of their own poverty. But something stirred in them and they wanted to work as hard as they could at their vocabulary in order to help those in need. Thanks for reminding me of the power of this site. It's that time of year again and studying has commenced, so maybe I will pull Free Rice back out and challenge a whole new set of students to help feed those who need it most!